Transition Denver, the Mile High Business Alliance, Denver Botanic Gardens and the Living Earth Center, among many other organizations, founded the Grow Local Colorado Campaign to promote local food production, with the goal of 2009 new gardens in 2009. A garden is defined as anywhere food is growing where it wasn’t growing before, like basil in a pot next to one’s sink, strawberries in a hanging basket on a balcony, or taking out part of one’s yard to grow vegetables. 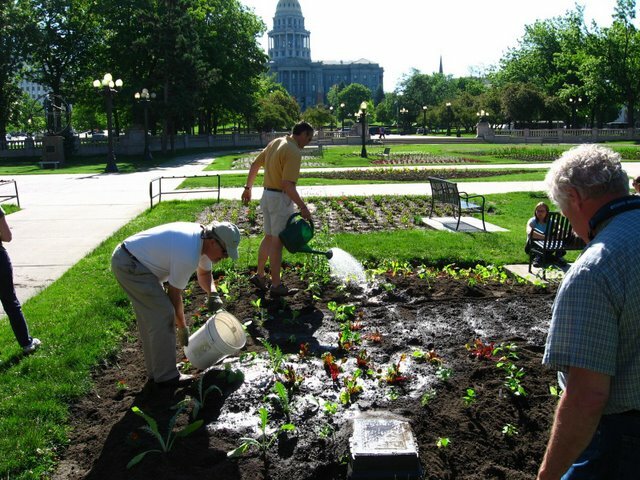 The Mayor of Denver, John Hickenlooper, supports the Grow Local Colorado Campaign and proclaimed May 14 Grow Local Day, and encouraged a vegetable garden to be planted in front of the City and County Building in Denver’s Civic Center Park. Transition Denver, The Mile High Business Alliance, Denver Botanic Gardens, the Living Earth Center, as well as representatives from Slow Food, Denver Urban Gardens, and Feed Denver planted the garden on May 31. The food harvested will be given to Urban Peak. Transition Denver is collaborating with other organizations to create a citizen’s advisory panel which will meet with city employees to start exploring more possibilities of growing food in public spaces in Denver. Photos courtesy of Scott Goodman (view full album). Denver Civic center garden is good and is full of colors. I have rarely seen these types of gardens. If you are intending to make your garden like the above shown pictures than I would like to Recommend you Phoenix Landscaping. They are really great and will certainly be beneficial for you.